Members of the National Federation of Federal Employees (NFFE-IAM) and other federal workers, hit hard by the Republican-controlled Congress and its anti-labor agenda, rally outside the U.S. Capitol in Washington, DC. 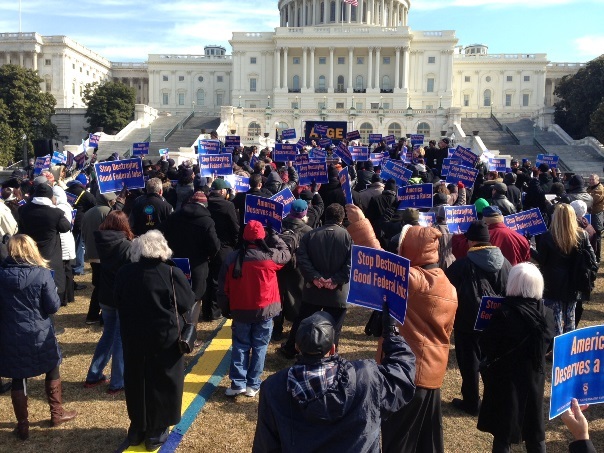 A new Machinists News Network video highlights a rally in support of federal workers who have been hit hard by the Republican-controlled Congress and its anti-labor agenda. In recent months, millions of federal employees, including 175,000 NFFE-IAM members, have suffered through a government shutdown, pay freezes, furloughs and reckless slashing of retirement benefits. Rep. Keith Ellison (D-MN) joined other pro-labor lawmakers in recommitting their support for the bargaining rights of federal workers.